The convergence of automation, artificial intelligence, advanced manufacturing and big data analytics is poised to remake the transportation, electricity and manufacturing sectors in ways that could eliminate oil use. This comes just as the same energy innovations are making it easier and cheaper to extract oil and gas. Why it matters: These technological changes mark an end to the psychology of oil scarcity that made Western democracies more tolerant of erratic actions by OPEC and other oil-producing states. What's new: Historically, OPEC's power derived from anxieties about scarce future oil supply, and Western industrial nations had to kowtow to ensure oil supplies did not get reduced or cut off. Now, the tables are turning. 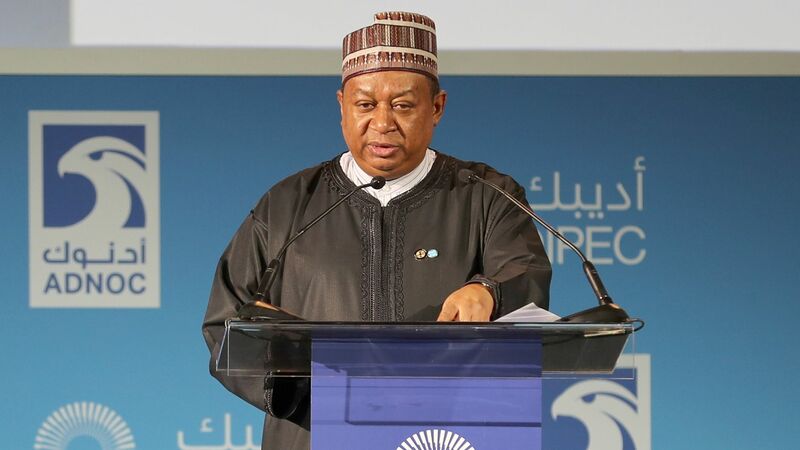 Worried about the group's future, OPEC's Secretary General Mohammed Barkindo toured Washington, D.C., last week to spread his "sustainable stability" pitch. Yes, but: Barkindo's message is going to be a hard sell to U.S. policymakers who have been considering federal legislation that would subject foreign oil producers to possible antitrust action by the Justice Department amid the rising role of U.S. oil and gas in global markets. Between the lines: The geopolitical fallout could be monumental, as the technology boom has lessened the common interests between oil-producing states and Western industrialized nations. Norway, where one in three cars are electric, just announced that its national pension fund will drop some oil investments amid concerns about oil’s future, and other countries may follow its lead (as they have in the past on coal). Norway's divestment spared oil companies that are investing in clean technologies — a move that explains Big Oil's recent romance with green investment announcements. As a new wave of civil unrest spreads across the Middle East, technological changes could threaten the viability of OPEC to sustain member oil revenues by making oil cheaper just when the world will need less of it, rendering OPEC less useful. The group already offers little hope to countries whose oil industries are imploding, such as Venezuela and to a lesser extent Nigeria and Libya. What to watch: The U.S. may have to help vulnerable oil dependent economies make economic reforms to diversify away from oil and create new jobs for growing populations. Go deeper: Read "The Tech-Enabled Energy Future" report from CFR. Amy Myers Jaffe is the David M. Rubenstein Senior Fellow for Energy and the Environment at the Council on Foreign Relations and director of its program on energy security and climate change. Saudi Arabia announced an oil production cut of 500,000 barrels per day on Tuesday, just weeks after Treasury Secretary Steven Mnuchin said "U.S. friends in the Middle East" would compensate for the drastic decline in Venezuelan oil production driven by U.S. sanctions. Why it matters: Although U.S. production continues to rise, it still accounts for only 11% of global consumption, compared to OPEC’s 32%. The recent supply cuts illustrate that sudden disruptions and U.S. sanctions that take oil out of the market can put OPEC, and Saudi Arabia specifically, back in charge of global oil prices. Background: The U.S. economy is 60% less oil-intensive than it was in the 1970s, with virtually no oil used in electricity generation and limited quantities in manufacturing. Still, the transportation sector — with 350 million liquid-fuel cars on the road — has made little progress reducing its overwhelming dependence on oil-based fuels. That means Americans remain susceptible to the effects of an oil-price shock. Yes, but: President Trump has shown a willingness to release the U.S. Strategic Petroleum Reserve, which could help drive down prices in the event of further supply reductions. This is particularly pertinent for Saudi Arabia, which shut down an oilfield after a power accident two weeks ago, and Venezuela, whose oil sector would need several years, billions of dollars and new foreign investment to return to previous production levels, even with a change in government. What's new: Trump, together with Congress, appears to have one other card up his sleeve. Last week, the House Judiciary Committee unanimously passed a bill that would subject the assets of any oil-producing country that participates in an OPEC agreement — or even individual countries with side agreements to limit oil supply — to U.S. antitrust action, including federal lawsuits to force sales of subsidiaries and compensation payments to harmed parties. That threat alone caused Qatar to quit OPEC, and prompted its secretariat to caution members against making explicit statements about using production cuts to reach a particular price. What to watch: While OPEC has the reins for the moment, the threat of the House bill might give Trump more leverage over the organization and its members and collaborators. The sweeping ambition of the Green New Deal (GND) has raised questions about how it will be paid for. But it’s important to consider how its potential outlays might intersect with investments that will need to be made anyway to replace aging U.S. energy infrastructure. The big picture: The U.S. already needs to increase its infrastructure investment by more than $3.8 trillion by 2040 in clean water, energy and electricity, transportation networks and telecommunications. The GND could offer a way for policymakers to direct the infrastructure repair and upgrading that already needs to be done in service of fighting climate change. Background: In the wake of natural disasters, there have been many missed opportunities where federal dollars have gone to restoring, rather than rethinking, poorly designed infrastructure. PG&E’s history of constantly replacing hundreds of residential electricity transformers that fail during heat waves instead of installing new technology is a case in point. This started to change with the October 2018 Disaster Recovery Reform Act, which allocates 6% of disaster funds to improve resilience, not just to replace destroyed facilities. Moving forward, the GND could serve as a roadmap for ensuring federal dollars get spent wisely and fairly. Spending on resiliency and decarbonization could overlap via new technologies, as New York, Hawaii and other states are investigating. Instead of spending $12 billion on sea walls to protect every critical refining facility on the Gulf Coast, a portion of that money could be diverted to construct electric charging infrastructure or landfill gas programs for alternative fuel vehicles. The Pentagon and Congress could rethink how to secure U.S. military bases threatened by climate change in ways that align with the GND. Ditto for the Pentagon’s research and development programs on future fuels, logistics and automation. Restoring wetlands, mangroves and green space is also a cost-effective way to reduce climate-related damage. GND legislation could also facilitate private-sector tie-ins for federal green infrastructure investment with green bonds and investment vehicles. What to watch: As politicians stake out their response to the GND, look for some legislators to tie in GND themes to programs that must be funded anyway or address multiple goals at once, like employment, energy innovation and decarbonization, especially in rust-belt regions. This proved a successful formula for governors the 2018 midterms, and will likely reappear in the 2020 election cycle.